"In first-person narrative, author Susan Krueger, Ed.D., expertly speaks for Addie, who tells her adventurous, sometimes heartbreaking, story of traveling across the Wild West from Texas to Arizona to Oregon, and then eventually settling on the Slaughter Ranch near the Arizona-Mexico border. Her father was none other than the famous John Horton Slaughter, a Texas Ranger, the sherrif who tamed Cochise County and an early settler of the San Bernardino Valley in the late 1800s. Along the way, Addie's mother dies; her family narrowly escapes a stagecoach robbery; her grandfather is rescued when their adobe ranch buildings collapse in a terrible earthquake; when pursuing a member of the Jack Taylor Gang, her father's earlobe is shot off; and Addie meets the powerful warrior, Geronimo. Addie Slaughter: The Girl Who Met Geronimo, proves to young readers that history is NOT boring - especially when retold by a child who actually lived it!" "An Arizona-based teacher for 32 years, Susan L. Krueger, Ed.D., earned her undergraduate, Master's and Doctorate degrees from Northern Arizona University. She taught first-grade students in Holbrook, elementary and junior high remedial readers in Flagstaff and elementary readers in the Cartwright District in Phoenix. She also taught adults at Chapman University and Arizona State University West. Though she officially "retired" in 2000, Krueger works now as much as she ever has. She joined the Phoenix Art Museum docent program and is currently their research chair. In addition, Krueger gives many slide show talks on art-related topics around the Valley of the Sun. She also writes research papers on art objects for use by museum docents. Krueger became interested in Addie Slaughter's story when her writers' group visited the Slaughter Ranch outside Douglas, Ariz. While there, Arizona Culturekeeper Dr. Reba Wells Grandrud, the John H. Slaughter Ranch historian, presented a slide show and discussed the adventures of the Slaughter family and the Slaughter Ranch. Krueger immediately realized what a wonderful children's book the information would make. After much research and hours of collaboration with Dr. Grandrud on the historical legacy of the Slaughters, Krueger wrote Addie Slaughter: The Girl Who Met Geronimo, which is being published by Five Star Publications. Born in Northern Calif., Krueger now lives in Phoenix, Arizona." In my opinion, there's no better way to tell a story to a child than with a first-person account...even if that person is fictional or is unable to write the story themselves. I remember loving the American Girl series books as a child because they were written in diary form, and I love this book for a similar reason. As you read this book, you feel as though you are living through Addie's life right along with her, and it's almost as if you are reading her own diary. There are even pictures interspersed with the narration to give an even more realistic picture. Addie Slaughter lived through a very exciting childhood, and I think this is a fantastic book for young children to learn about her. It will keep them engaged, and it's easy to read and understand. If you're a teacher, there's an added curriculum guide at the back of the book to help engage your students in discussion and help them gain a better understanding of the circumstances surrounding Addie. Even if you're not a teacher the curriculum guide can help you into a dialogue with your children and guide you toward more learning opportunities on the subject. Cost: You can buy Addie Slaughter: The Girl Who Met Geronimo for $12.44 from Amazon.com. Overall: We give Addie Slaughter: The Girl Who Met Geronimo a 9.5/10! 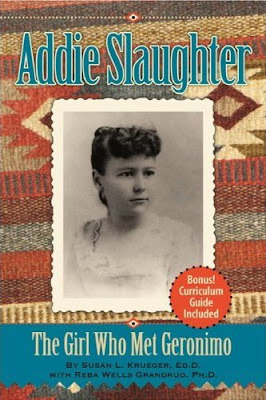 How would you like to win my copy of Addie Slaughter: The Girl Who Met Geronimo?? We were sent copy of the book "Addie Slaughter: The Girl Who Met Geronimo" free of charge for the sole purpose of this review; no other compensation was received. All opinions expressed are my own. This is a MamaBuzz review. The product was provided by Five Star Publications for this review. I learned that most of the book's photographs come from Slaughter family albums and the collection of Dr. Grandrud. I learned that the info came from actual stories told by Addie to her daughter. I would love to read this book and then share with my grandson. I learned that Susan Krueger, Ed.D, will be making appearances as part of the Celebration for Arizona's February 14th, 2012 Centennial. This book has been designated an Arizona Centennial Legacy project! I learned that the book costs more on their website then on Amazon ($15.95 vs $12.44). "Her father was none other than the famous John Horton Slaughter, a Texas Ranger, the sherrif who tamed Cochise County and an early settler of the San Bernardino Valley in the late 1800s." I learned that the author, Susan L. Krueger, was teacher for 32 years. I learned that the Slaughter Ranch is near the Arizona-Mexico border. I learned that Krueger’s book is based on actual stories told to Adeline Greene Parks by her mother, Addie Slaughter, and in-depth interviews with Arizona Culturekeeper Dr. Reba Wells Grandrud, the John H. Slaughter Ranch historian.